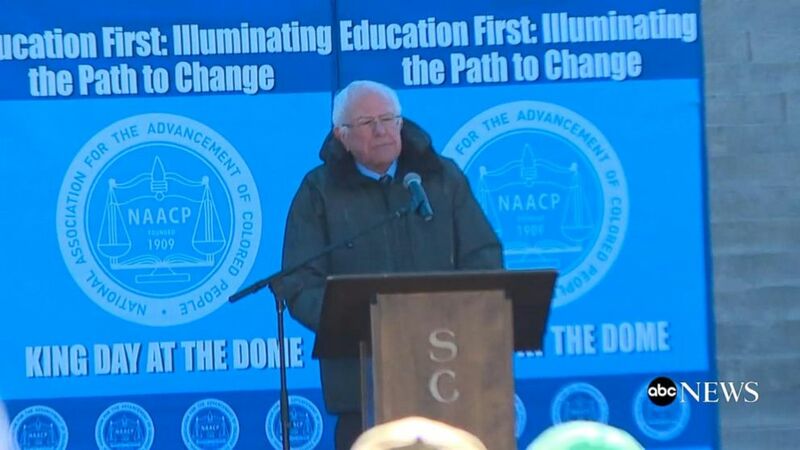 Sen. Bernie Sanders' visit to South Carolina -– a state where African-Americans make up nearly 30 percent of the population –- was a signal to some in the Palmetto State that he intends to target black voters. In speeches at churches, community centers and colleges, Sanders reminded voters repeatedly about his civil rights upbringing, having marched with Dr. Martin Luther King Jr. during the March on Washington as a college student. According to exit polls in the state, Sanders won roughly 14 percent of black voters in South Carolina. Hillary Clinton, however, won 86 percent of the black vote in the state. Minority voters will play a significant role in determining the next Democratic nominee in 2020. A recent report found African-Americans, Asians and Hispanics are expected to increase as individual voting blocks. Whereas "Whites without a college degree," a voting block that has leaned Republican, is expected to drop in 2020. Bitzer said, “for any Democrat that wants to be in the top tire of the field it’s going to be a requirement” to secure the black vote. Sanders, who hasn’t announced that he is running for president, held several events around Martin Luther King Day including a private meal and meet and greet at Big T’s Barbecue, a popular black-owned and operated soul food restaurant with “Our Revolution,” a political non-profit formed by Sanders supporters following his 2016 campaign. During his visit to Columbia, South Carolina, Sanders also ratcheted up his rhetoric during stops at Benedict College, a historically black college and Zion Baptist Church, a historic African-American church. 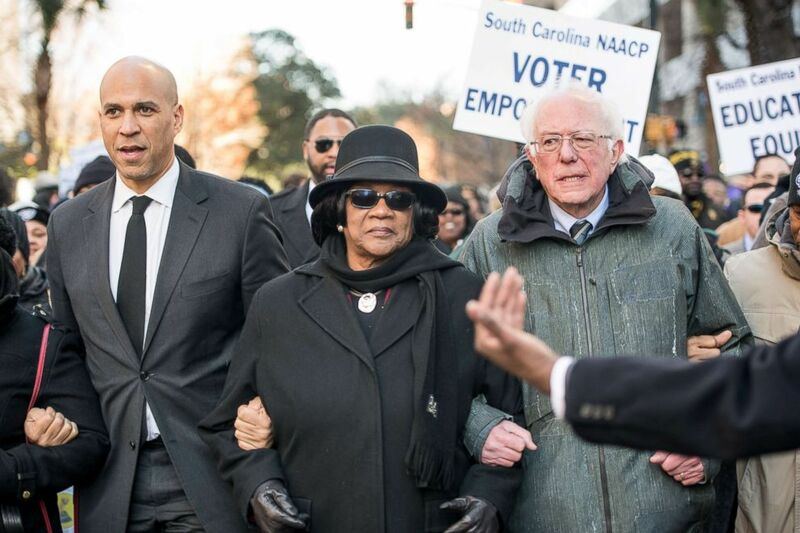 Sen. Bernie Sanders (I-VT), right, president of the South Carolina NAACP chapter, Brenda Murphy, center, and Sen. Cory Booker (D-NJ) march to the Statehouse in commemoration of Martin Luther King Jr. Day, Jan. 21, 2019, in Columbia, S.C.
Sanders made headlines at the NAACP rally at the South Carolina State House by calling Trump a “racist,” an attack line that Sanders has used several times over the course of Trump’s political career. Republican National Committee Chair Ronna Romney McDaniel tweeted that Sanders' "racist" comment was “absolutely disgusting and wrong” on Monday. While his remarks were not well received by Republicans, his rhetoric was met with applause from majority African-American audiences in South Carolina. On Martin Luther King Day, the South Carolina NAACP held a town hall at Zion Baptist Church. The group reportedly invited Sanders and Booker but Sanders was the only 2020 potential candidate to attend the event. Angela Douglas, a city councilwoman in Chester, South Carolina, moderated a town hall with the Vermont Senator. She told ABC News, “I think it was an intentional push to come and meet with folks in South Carolina, particularly to participate in black activities. He has talked about his civil rights activities in the past as a strong suit.” Douglas, like many South Carolina politicians ABC News spoke to, hasn’t yet decided who they will be supporting in 2020. Jaime Harrison said Sanders' remarks at the NAACP town hall are creating a synergy on racial equity issues and economic inequality issues. The former South Carolina Democratic Party chair said that he believes Sanders message "will be well received in a state like South Carolina." Harrison, who is associate chairman and counselor of the Democratic National Committee, said he will not endorse a candidate in the 2020 election. He said the party needs "a candidate that can inspire our base to go out and vote." Nearly every Republican who has won the South Carolina primary since 1980 has won the nomination, the only exception being former House Speaker Newt Gingrich in 2012. For Democrats in South Carolina, over the past three decades, nearly every person who won the state eventually won the Democratic nomination. The only exceptions were the 1988 South Carolina caucus, which was a game changer for then-candidate Jessie Jackson, and John Edwards in the 2004 presidential primary. Govan who is the chair of the South Carolina Legislative Black Caucus extended an invitation to Sanders to speak to a nonpartisan group that supports black legislators in the state. African-Americans represent 44 members of the South Carolina House of Representatives and 13 members of the state Senate. Govan said his group is the second largest legislative black caucus in the country, only behind Georgia. Govan told ABC News that Sanders is the only potential 2020 contender to address the group, so far. In addition to his remarks to the Legislative Black Caucus on Tuesday, Sanders also spoke to the State’s Democratic caucus about the wealth gap, health care, taxes. Govan, who voted for Hillary Clinton in 2016, said he hasn’t decided who he is supporting in the primary, but warns candidates "will have to put their best foot forward if they want to be successful." Sanders isn’t the only potential 2020 candidate who has eyes on the first-in-the-south primary. Several candidates have already booked venues for events at some of the most popular black-owned restaurants in the state. Candidates, such as Sen. Elizabeth Warren are personally calling local government officials in an attempt to court them for support. Sen. Kamala Harris, the only African-American who has announced a 2020 bid, traveled to South Carolina to address members of the Alpha Kappa Alpha sorority, the oldest black sorority in the U.S., and an organization which Harris joined as a student at Howard University.